Throwback Thursday is a weekly meme hosted by Renee at It’s Book Talk. Throwback Thursday is an awesome opportunity to share old favorites as well as older books in our TBR. I love this idea as I only started blogging about two years ago. Therefore, I have lots of old favorites to talk about. While I may not remember all of the details needed to write a complete review, I’m happy to share the thoughts and impressions that have remained with me long after I finished the book. 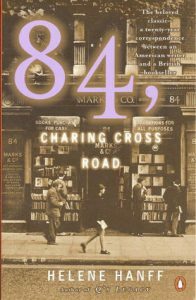 84, Charing Cross Road was a book club read back in 2015. It was absolutely delightful! I love epistolary literature and this one did not disappoint. I found it to be charming and funny, smart and sweet. At only 112 pages, it’s easily read in one sitting. If you’re short on time during this hectic holiday season but looking for a great read to sneak in, I can definitely recommend this book. It would also make a lovely gift for almost any reader. One of my all-time top 10 books. So glad you loved it. I read 84, Charing Cross Road years ago, but remember so little about it. This would be a great book to pick up for a reread. Yes, I agree! I hardly ever reread but this was so quick and delightful!